PINUKPUK, Kalinga – The province of Kalinga continues to shine for its people as local officials led by Governor Jocel Baac, spearheaded the ceremonial opening and blessing of another multi-million farm-to-market road (FMR) here, today. The ceremonial opening and blessing of the Catabbogan – Wagud Farm-to-Market Road (FMR) located along the “Cal-owan line” here was held on February 11, 2019. “With 87 percent accomplishment, the 13.2-kilometer FMR is expected to be completed this coming month of March,” said Engr. Domingo A. Bakilan, Provincial Agriculturist and head of the Provincial Project Management and Implementing Unit (PPMIU) during the program held in barangay Ammacian. Funded under the Department of Agriculture’s Philippine Rural Development Project (DA-PRDP), the Catabbogan-Wagud FMR is the 3rd implemented FMR subproject of the province in support to the local coffee industry. It has a total project cost of P217.3 million jointly shared by the World Bank 80 percent, the National Government through the DA 10 percent and the Provincial LGU of Kalinga 10 percent. “Manu nga dekada en ti napalabas nga nu aglugan ka magapo ditoy inggana Tabuk ket ad-ado pay ti pagnaem nu ti pagluganam (Several decades have passed wherein walking is longer than riding when travelling to Tabuk City from here),” shared Domingo Lagayon, Chairman of barangay Malagnat as he expressed his gratitude for the construction of the road. Benefiting around 1,428 households or 7,712 population, the road project covers barangay Catabbogan, Malagnat, Taggay, Ammacian and Wagud of Pinukpuk and barangay Sacpil of the municipality of Conner, Apayao. 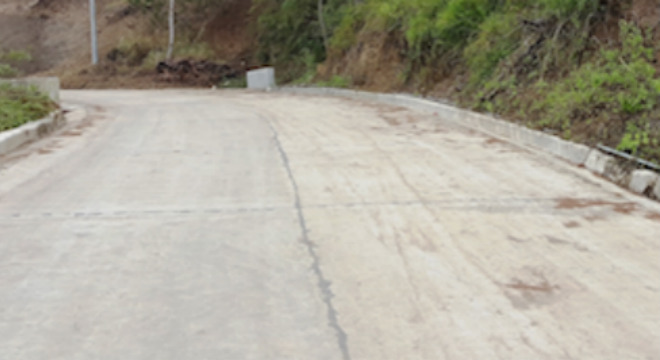 “Nabayag nga gagar tayo ti panaka-simento na daytoy nga kalsada ket tatta nga inmagpayso ket aramiden tayo kuma ti rumbeng (The concreting of this road was long awaited and we should do our roles now that it’s here),” urged Pinukpuk Mayor Irving B. Dasayon as he encouraged the residents to be more productive in providing for the needs of their families. Dasayon further said that this project is a result of the cooperative efforts from the DA, the LGU and the beneficiaries hence it should be used for its purpose and not to be exploited by lawless elements. “We remain as your partner in providing development initiatives for progress and pledge to continue doing it,” he added. DA-CAR Regional Technical Director Danilo P. Daguio in his message pointed out three contributing factors for Kalinga’s smooth implementation of PRDP subprojects: cooperation among beneficiaries, strong support from local officials, and strong and effective governance. “Nu ada ti kalsada nga napintas, ad-ado pay ti umay nga suporta, serbisyo ken oportunidad ditoy ayan yo (if there is a good road, more support services and opportunities will follow),” added Daguio. The chairmen of the barangays covered by the FMR subproject, for their part, expressed their commitment for the maintenance and monitoring of the FMR. Governor Jocel C. Baac also expressed his gratefulness for everyone’s effort for the realization of the FMR subproject. “Naaramid daytoy gapu iti pinag-kaykaysa tayo isunga isu ti theme ti founding anniversary tayo tadta nga tawen (This was realized through our unity which is also the theme of our province’ founding anniversary celebration this year) said Baac. The theme of the anniversary of Kalinga being celebrated this week is, “Celebrating success, peace, and unity, with Continuing Commitment to Good Governance” said Baac, adding that everyone should do their part and to work together as one province. The ceremonial opening and blessing of the Catabbogan-Wagud FMR is one of the highlights of the province’s 24th Founding Anniversary and 3rd Bodong Festival. In 2018, the province have successfully turned over two PRDP supported FMR subprojects and one enterprise subproject to boost the coffee industry of the province. These are the improvement of Banneng-Gombowoy FMR in Tanudan, the improvement of Bulanao-Amlao FMR in Tabuk City, and the Kalinga Integrated Coffee Processing and Marketing Enterprise with the construction of a Coffee Trading Center located in Tabuk City. The province of Kalinga was able to acquire a total investment cost from the DA-PRDP amounting to P775 million or 31.7 percent of the region’s cost share as of press time.